I’ve been so entrenched in my Green Tea Party, that I decided I needed to pause my clique-ish behavior and try to make some new friends. Naivetea has been busy recently with some new and exciting teas, and I took the opportunity to take a day and make it all about Oolongs. I began my day with Li Shan Oolong, which is grown in the highest altitude tea farms in all of Taiwan. Knowing this tea was so exclusive only made me feel that much more elegant as I experienced this lovely, delicate tea. It has the lightest floral perfume, and a soft sleek feel. The best word that comes to mind is refined. Sipping this delight, I almost felt underdressed. This is a tea with presence. A Lady Diana of teas. As I journeyed forth through my day, I continued with a cup of Da Yu Ling. I have to say, it is truly remarkable how Oolongs that are both grown in similar regions can have such distinct differences. 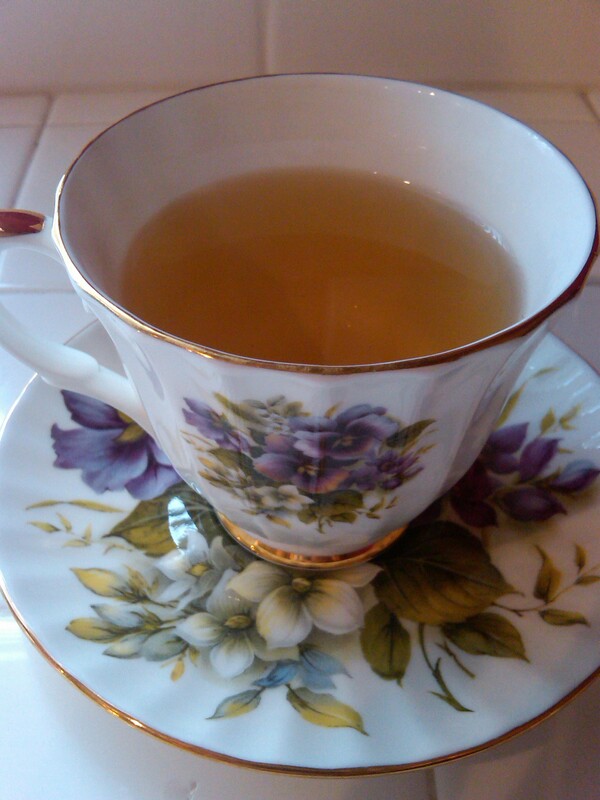 This tea had a smooth, almost buttery feel with that signature, yet mellow, floral perfume. The difference, however was in the tiniest peppery hint that brings to mind evergreen forests. As it was a rare, chilly autumn day in Southern California, this felt like the perfect choice. 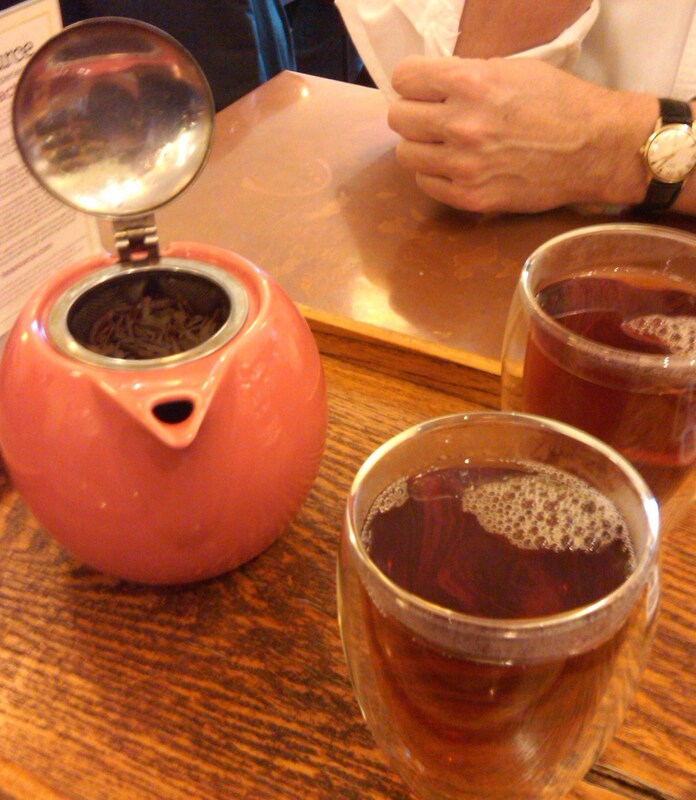 As I made my way through the lunch hour, I chose to have a little fun and try the Kyoho Grape Oolong. As I opened the package, I was struck by the scent of grape Jolly Ranchers! Once I added the hot water the scent took on a level of sophistication that fused the grape with the floral. This is a robust tea, very full, and almost had the essence of grape Kool-Aid, though I don’t mean to cheapen the beautiful flavor. I was just amazed at the fact that a tea could maintain a profile of grape without that over-sweetness I associate with fruit teas and infusions. This was a perfect balance of grape and floral notes that was satisfying, but with a bit of playfulness. And as the day approached evening, I was ready for something light. White Peach Oolong sounded like just the ticket. What a way to close out my day! 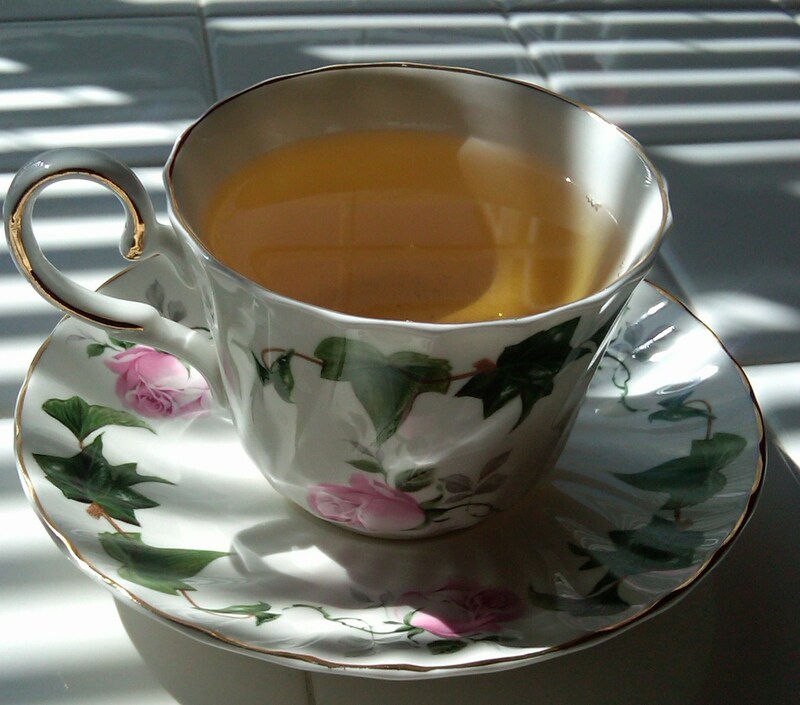 This light and smooth Oolong had just a whisper of peach with no fruity aftertaste – a triumph in my book! As the rains continued, I lounged happily with my cup of sunshine. One word of caution – take care not to oversteep. I made this mistake once and encountered a slightly metallic taste. However, the greatest beauty of this tea is its ability to be delicious hot or cold. Some of the other Oolongs can take on an astringent quality as they cool. 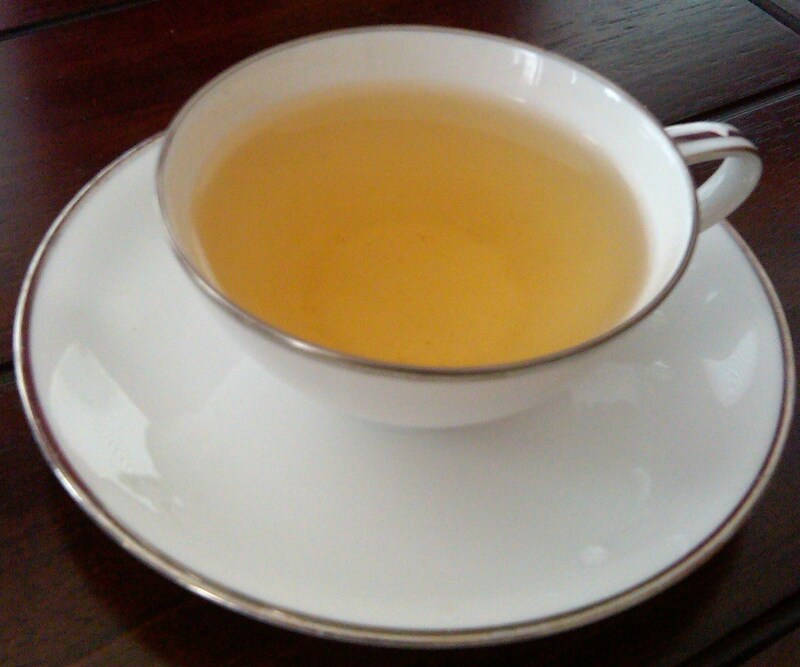 This Oolong is beautifully smooth hot or over ice. I can’t wait for the California sun to re-emerge so I can fully appreciate White Peach Oolong on ice! A good day. A very good day. New flavors and fragrances accompanied me through the day, and not a stinker among them. Naivetea continues to surprise and delight. An International Tea Moment now has a Facebook Fan Page! 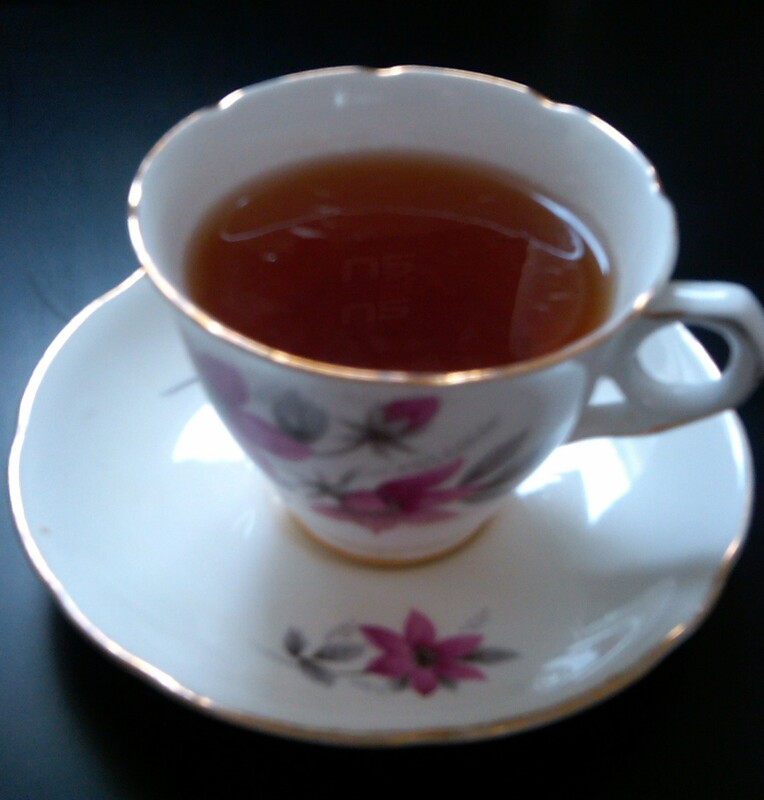 Share your Tea Moments with me there at http://www.facebook.com/TeaMoment. 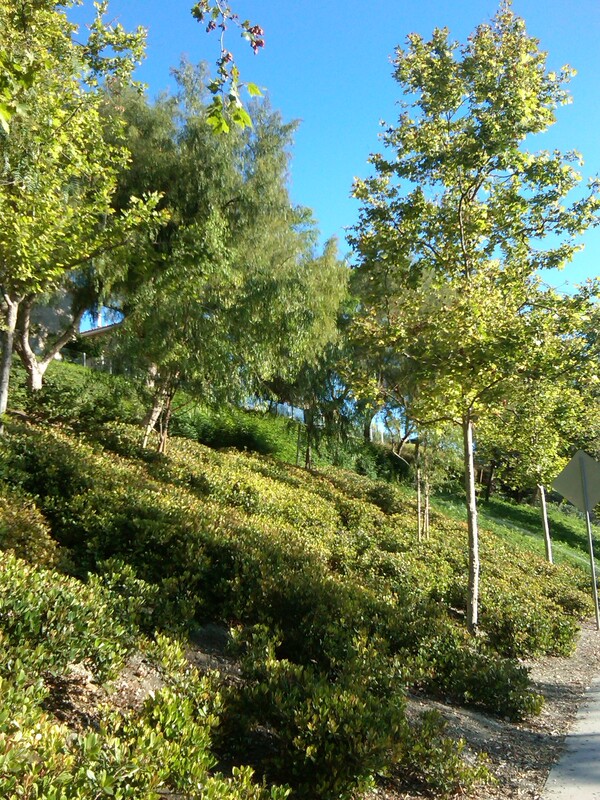 Yes, I live in Southern California, and yes, it is typically beautiful weather most of the year. This summer, however, has been suffering from an ongoing case of June Gloom. For those of you unfamiliar, June Gloom is the presence of a marine layer that hangs around for most of the month of June, leaving the skies looking overcast. More Seattle than San Diego. The gloom has persisted for much of July, and finally we’re seeing trace glimpses of what summer days (and in particular, mornings) are all about. 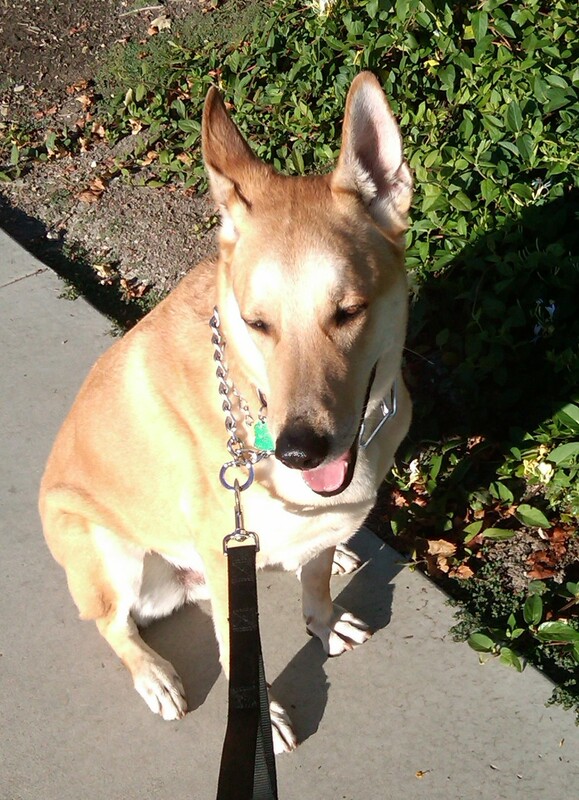 To celebrate, I took the dog on a walk to enjoy the sunshine-y brightness, that beautiful morning light where everything seems clearer, more brilliant, and more dazzling than any other time of day. Ed (our dog) was terribly excited at the prospect of being out and about in the early morning hours. 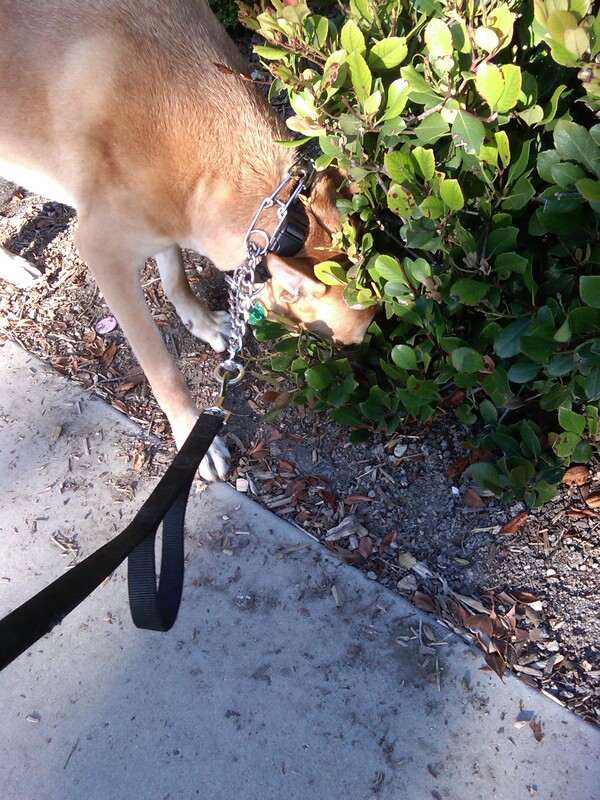 There was apparently a lot of doggy news he had been missing out on, and he had a lot of sniffing up to do. We took our time, soaking up the sun and the quiet. We saw bunnies racing up the hills and darting under bushes, birds of every size and shape chasing each other and singing their morning songs. And then we also saw a couple of signs pleading with the good people of the neighborhood to be on the look out for a lost, small, black and white lap dog. Ed and I looked at each other sadly and shook our heads. “Coyote snacks,” we agreed. The circle of life. With a summer morning soaked into my June-Gloomy bones, I was ready to continue my path on my green tea journey. As luck would have it, I had just received a shipment of Tamayokucha from Two Leaves and a Bud, a tea company I was recently introduced to. This tea is described as an ‘extremely green’ tea. However, it was still from China and is a Gyokuro style tea, which means it is covered for its last weeks of growth to bring out the floral notes of the tea. I opened the package and was hit by the scent of pure summer. Early morning memories from my childhood of the neighbor’s lawn being mown at 7 in the morning. The fresh cut grass, soaked with dew. I brewed the tea, and the steeping liquid was still infused with that summer scent, but was much more mellow and slowly turned more earthy. The first sip. It’s much brighter than the greens I’ve been exploring. A hint of sweetness and bitterness at the same time. It’s… intriguing. An acquired taste. And I’m hell-bent on acquiring that taste. I’ve spent my last few mornings now with this tea, and each day it becomes more familiar, no longer a stranger, not so abrasive. My palate is changing with this journey. I’m appreciating the new nuances, profiles and earthy flavors that I ran from in the past. And so my journey continues. I seem to keep gathering new companions along the way. But I’m also glad to have my old companions continue on, who are tried and true. I’ve had a mini crush on Lindsay’s Teas since I discovered them at the World Tea Expo (then known as ‘Take Me 2 Tea’) in 2003. Her Envelope Teasers, I must say, are brilliant. These are individual tea bags (yes, I said tea bags) tucked into the cutest little envelopes. They are great for slipping into a purse, providing as party favors, etc. I wish I could find these in vending machines! When I discovered our neighborhood coffee house, The Neighborhood Cup, serves Lindsay’s Teas (loose leaf, by the way) I was thrilled. And for my Green Tea Party, I had to invite them to the shin-dig. In particular, I thought a royal presence would be a good thing, so enter Empress Jasmine. 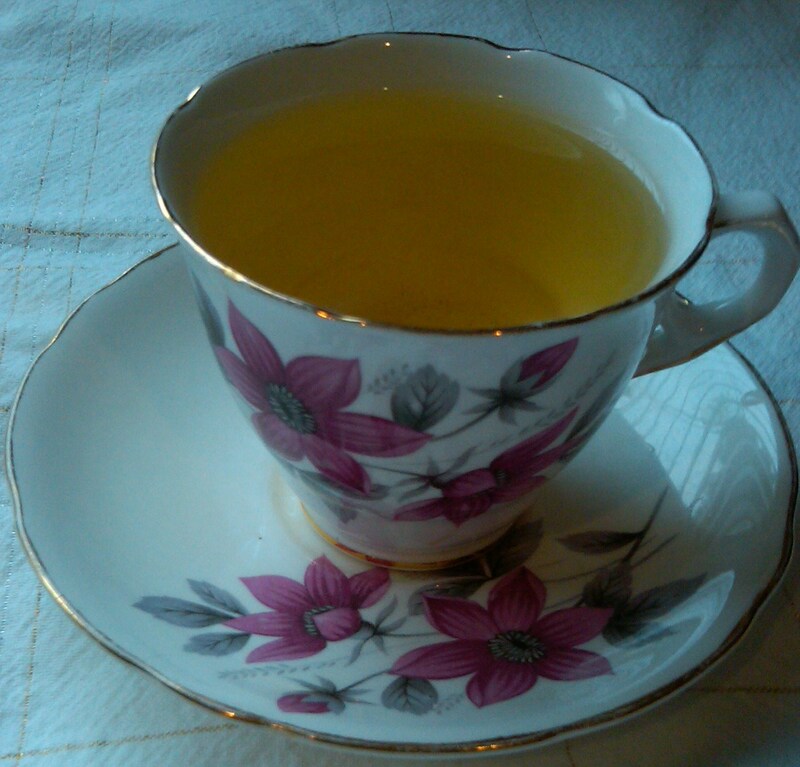 A Chinese green tea, the aroma is a gentle jasmine – almost comparable to an oolong. 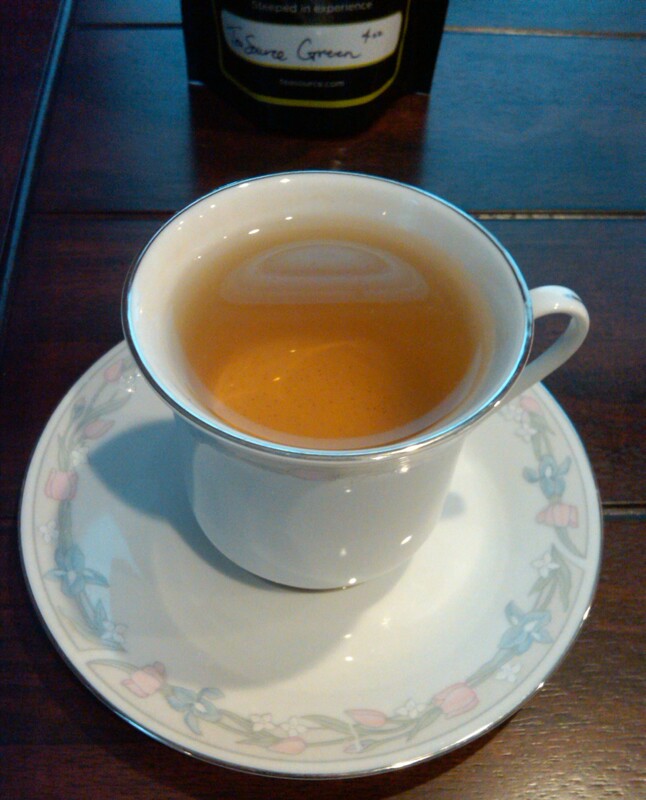 But the steeped liquid is a medium amber – closer to my black teas than the greens I’ve been exploring recently. I can’t help but sit and just inhale the lovely perfume for a minute or two, but then it’s time for the first sip. It is stronger than the other greens and I wonder if perhaps there is some black tea blended in. The earthy green-ness is there with the lightest hint of grassy sunshine. I detect a touch of astringency, but I wonder if that is my fault for possibly over-steeping. The Empress and I passed a lovely morning together. She may not be as approachable as I would have hoped, but as with all my Green Tea Party guests, I think the more time we spend together, the more chummy we will become. 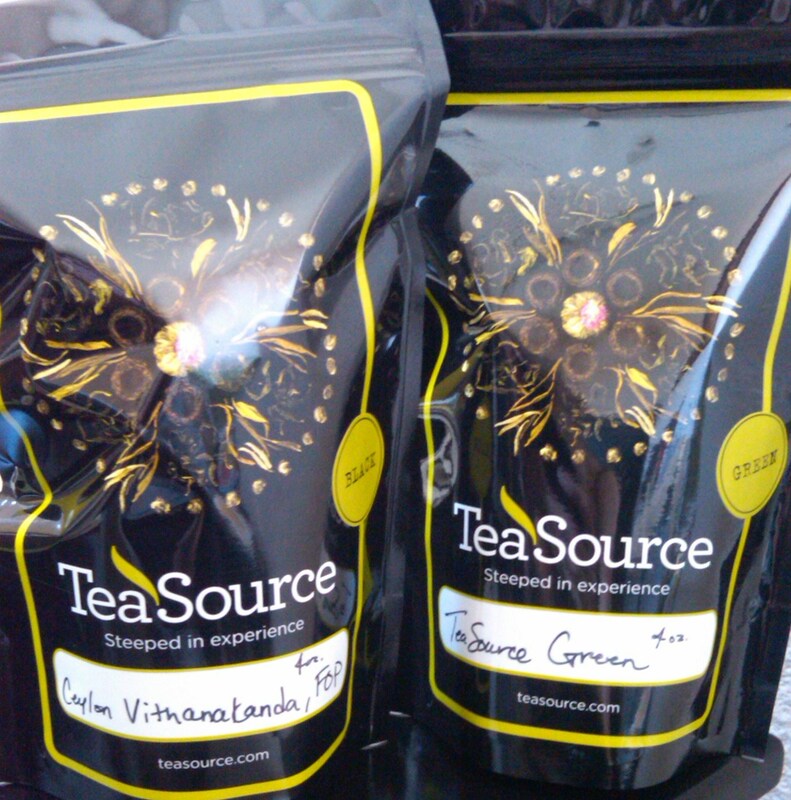 The Green Tea Party continues… I have to say that I was instantly impressed that TeaSource had a ‘House’ green. 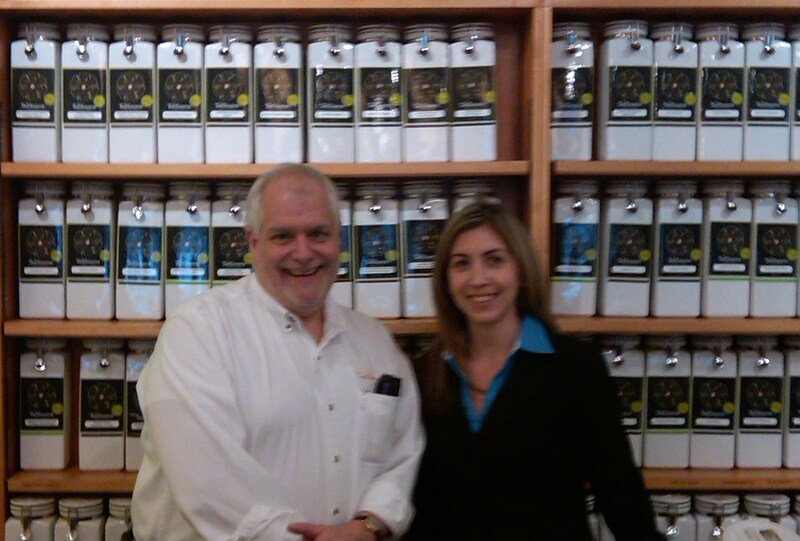 When I asked owner, Bill Waddington, what green tea he would recommend he immediately recommended the TeaSource Green. Typically, one might be a bit skeptical of the ‘house’ anything, but in this case I’m feeling that the House Choice is one that deserves special attention. I’ve spent my week with this house specialty, and despite Aesop’s musings that familiarity breeds contempt, I found that in this case familiarity bred harmony. I’ve had the package of this green tea for a while now, and opening it created a sense of holiday. Would I like it? Would it surprise or disappoint? As it steeped, my anticipation grew. The resulting liquid was a strong buttery yellow leaning toward a hint of amber. There was the slightest bit of sediment, but the brew was clear. I looked. I inhaled the sweetness of grass mown on a summer morning. And then… the first sip. I have always associated the taste of cut grass with green tea. But now I am also associating an earthiness. If I could assign a taste to the rich soil composed by an organic farmer, that would be the undertones of my growing understanding of green tea. This tea has more grassiness to it than the Dragonwell I tried before. On a scale of 1 to 5, with 5 being a handful of my freshly cut lawn, the Dragonwell would be a 1.5 and TeaSource Green would be a 2. To say that I enjoyed this cup of tea would be overstating my experience. I tolerated it, knowing that my palate was biased against it. I didn’t dislike it. But if I had other choices, it would not be my first, second, or even third choice. That being said, I poured another cup on Tuesday, on Wednesday, on Thursday. Each day, I would sip on two or three cups throughout my mornings. Each cup introducing me to new nuances, new depths, even new aspects of the grass I so dislike. In my desire to understand this tea, I have found that it has become a comfortable sweater. A dog-eared book. Something that represents the safe and familiar. I am being reminded of something as I watch Edie navigate through her second year of life. Nothing comes without practice, frustration and repetition. Whether learning to walk, saying a new word, figuring out which shoes goes on which foot, or experiencing new flavors, the first time is never a charm. It takes persistence to get to a point where one can say, “I tried this again and again, and I’ve decided I can do this well,” or “I’ve decided this is of no value to me.” Children get frustrated at new things and express that frustration often in loud and annoying ways. But they try again. They figure it out. They intuitively know they’ve got to do it this time and next time and the time after that. In that spirit, I look to the next leg of my journey. Not that drinking a new tea is ground breaking or oh-so-difficult. I completely get the fact that these musings are frivolous and privileged in several ways. But that willingness to be open, to try something new. It’s something I don’t want to lose, and this is one small way to keep that willingness alive and exercised. Until next time, drink green and prosper! I’m going green. I understand that I’m on the tail end of the green movement. I’m late to this year’s Tea Party as well. Nothing new in my life. It’s the same reason I sported Hammer Pants in 1991. I’m learning, however, that if you’re late to the party, why not just send out your own invitations. 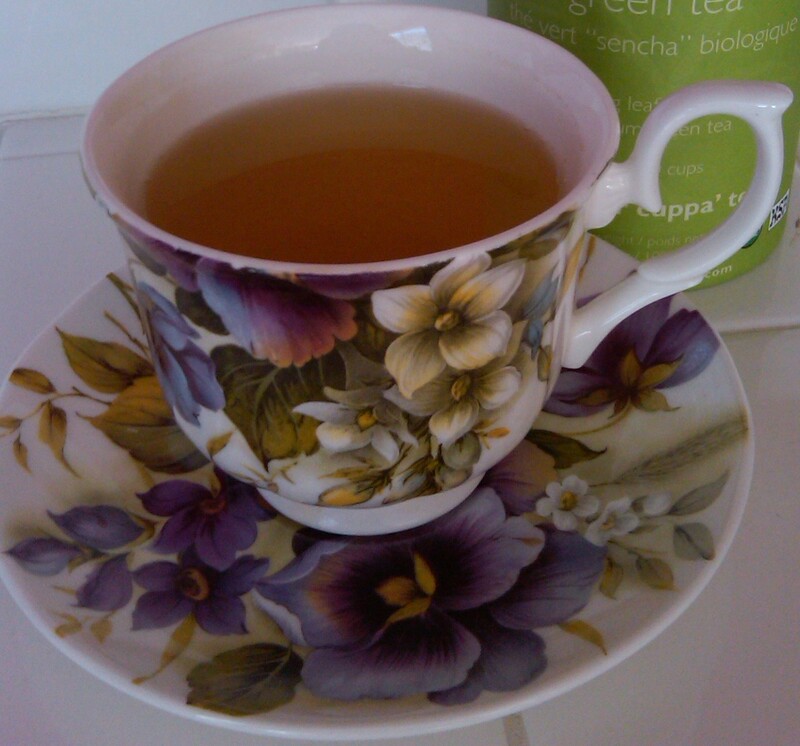 I’ll just have to start my own Green Tea Party, even if it is a party of one. “It is named after a single well, named as you would imagine, the Dragon Well. Located in Dragon Well Village, the well was located behind the Dragon Well Temple which was built over 1,700 years ago.Legend #1 According to the first legend, locals when digging the well found a stone shaped like a dragon and so they named the well Dragon Well. Legend #2 The well’s water is particularly dense and after rainstorms, the lighter rain water floats on the surface of the water and exhibits a twisting pattern which resembles the long and sinuous body of Chinese dragons. I have personally witnessed this effect. 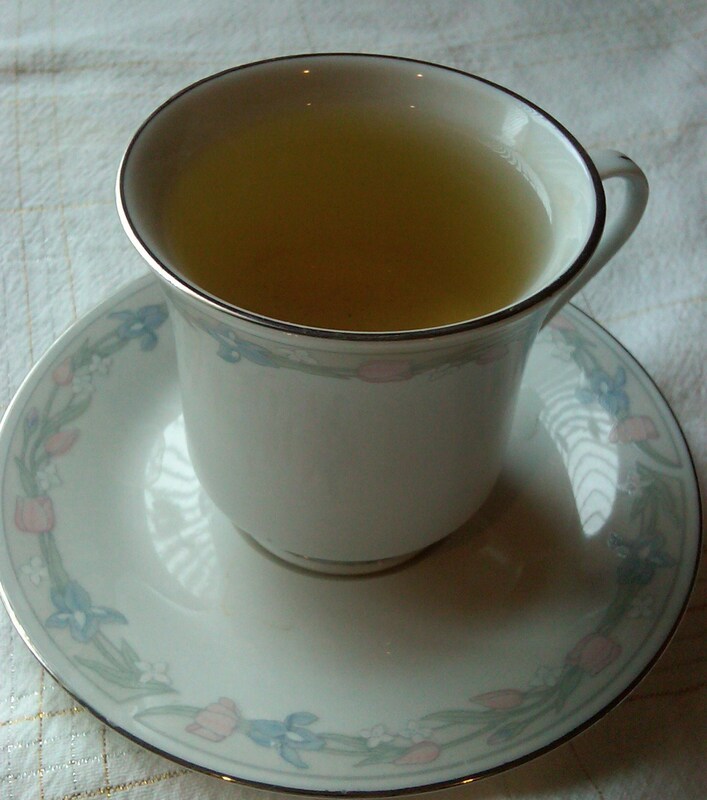 The steeped brew of Organic Long Jing is a pale yellow (like buttuh, baby), and clear, clear, clear. The mellow fragrance is that of freshly damp earth, almost like taking a hike in the high mountains at dawn. The first sip. The word that leaps to mind is, “Fresh.” It almost harkens to the aftertaste of a mint tea, but just barely – leaning more toward a vanilla finish rather than that hint of mint. There is a velvety smoothness to the liqueur, and it just feels good to have it flow through your mouth and down your throat. And despite my bent toward black teas, this tea has enough body to be satisfying in and of itself. The nuttiness is there with just the smallest dash of the grassiness I think of with green teas, and while these two elements are not my favorites, there is nothing unpleasant here. It may not be love at first sip, but I’m very glad to make its acquaintance. And perhaps, over time, this introduction will have the chance to bloom and grow into something more substantial and comfortable. And so, the Green Tea Party begins. Long Jing, thank you for coming. Yes, I’ll save you a dance. Here are my results of the blind tea tasting. Very fun experiment! This week I found myself back in the Twin Cities for a speaking engagement, and of course had to designate some “me time,” also known as “tea time,” before heading home again. Before my last trip to Minneapolis/St. Paul, Jason Witt had suggested I visit TeaSource, and unfortunately I couldn’t make it work. This time, however, I more than made up for it and may have found my new favorite Twin Cities destination! I contacted Bill Waddington, founder and owner of TeaSource, to see if he might have a few minutes to chat with a tea enthusiast who would be passing through. He graciously agreed, and on Friday afternoon I made my way over to a quaint and cozy corner of St. Paul near the University of St. Thomas and St. Catherine University. This location itself could take me down another anecdotal lane, but I’ll leave that for the moment. As I walked in the front door, I was greeted by the sight of two entire walls lined with tea cannisters. It’s one of my favorite sights. 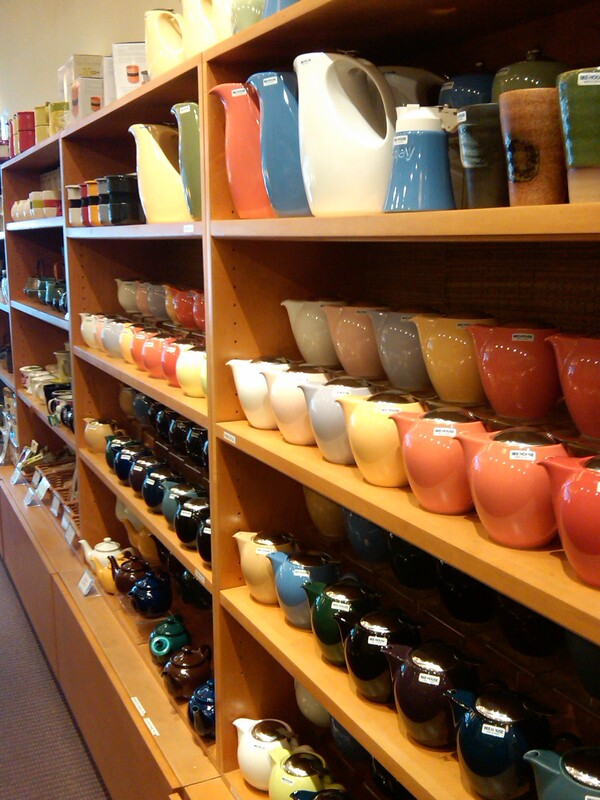 If I could somehow configure a wall of tea in my own home… Anyway, I acted as a fly on the wall for a moment, admiring the conversation between an employee and two women trying to choose a tea pot, because a third wall was lined with tea pots of various sizes, shapes and materials. The employee was great about finding out exactly what kind of tea they most enjoyed, how much they typically consumed in a sitting, did they like hot tea or cold tea. Then she educated them very succinctly and hospitably about her recommendations. It was a mini lesson in tea pots, but not stuffy or boring. Very accessible and interesting. Nice! Then I noticed a woman placing an order for tea at the counter. She asked for two or three different teas, the names of which were foreign to me. I watched how at ease she was with the place, how comfortable she felt about these teas. Obviously a regular here who had tried many different teas (of the 250 that may be in stock at any given time), had found some current favorites and was stocking up for home. I was greeted warmly by Bill, and he immediately offered to brew a pot of tea. I asked him his current favorite, knowing very well that “favorite” is a fleeting concept where tea is involved. After a bit of discussion, we decided I should be introduced to Ceylon Vithanakanda, FOP, his current go-to black tea. The dry leaf had, as he described it, a ripe fruit aroma, almost like a cantaloupe at its peak of ripeness so that in just a few hours it would be over-ripe. The steeping pot of tea and two clear tea glasses were placed on a wooden tray with a timer and he carried it out to the casual seating area at the front of the store. Patrons were seated comfortably at small tables for two or on the bright red sofa in the lounge area. A place to visit, a place to study, a place to reflect, the perfect place for tea. 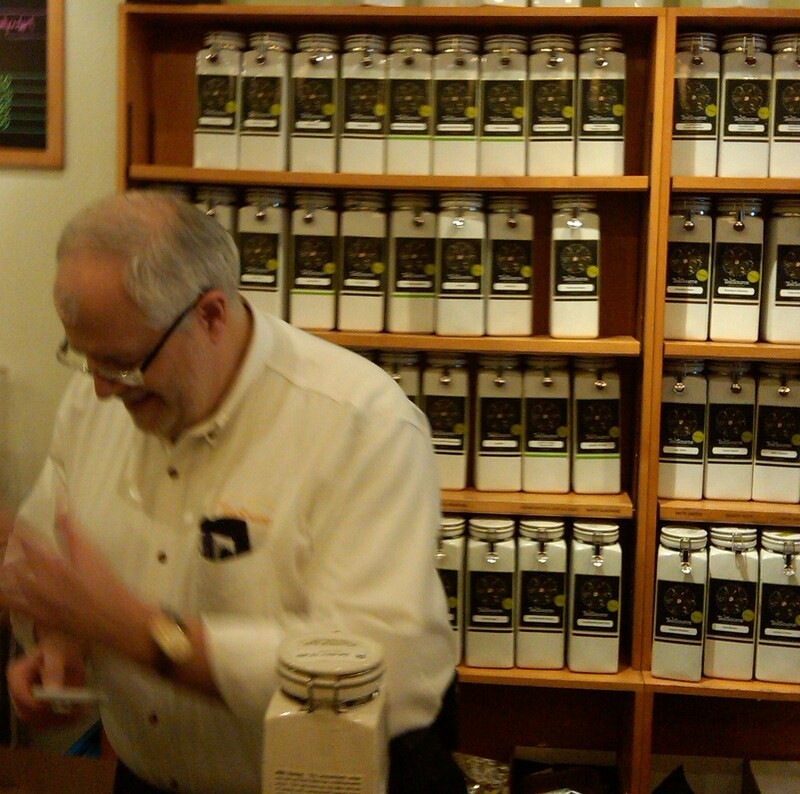 As the tea steeped, I asked Bill how he got into this world of tea. He explained he has always been a tea drinker, and around his 20’s he began to wonder if there were really, really good teas to be experienced, like there are really good wines or chocolates or cigars. He happened to work in a library at the time, and would occasionally flip through periodicals looking for tea related articles or papers. When he would come across a name of a tea expert, whether a grower or exporter or other, he would write a letter and ask if he could buy some tea from them. 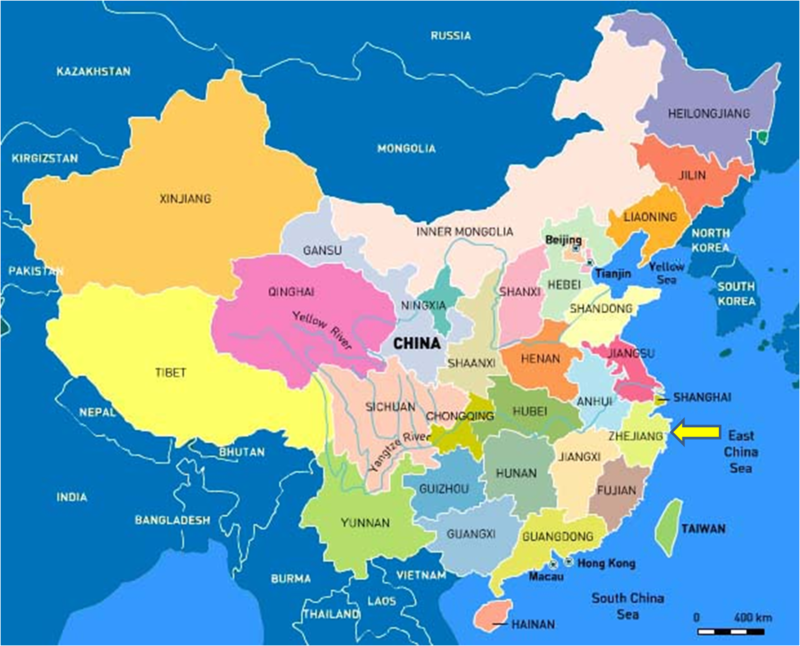 These letters would make their way to China, India, Japan, and other tea growing regions around the world. As has been my experience in the tea microcosm, the response to him was very positive. Relationships were formed, Bill was introduced not only to the intricate and nuanced world of tea but to a circle of mentors who would continue to expand his network to this day. At one point, we realized that we had been in the same tea cupping class in Boston in 2003, he as an assistant to the instructor, Michael Spillane, and I as a student. The tea world, as with all industries, is a small one! But I am forgetting to spotlight the star of this Moment. The Ceylon. Bill had wanted me to try this one because, while not a rare or expensive Ceylon, it is full bodied, with a lot of mouth feel, the fruit tones in the aroma transferring to the liquid itself. He admitted that even with access to much more rare or expensive Ceylons, he found himself coming back to this one again and again. The steeped liquid was a very orange, almost red, amber, and I was very happy to indulge in that first sip… Full, rich, hitting every point on my palate. This was just the kind of cup to start your day with purpose and momentum. I could envision consuming gallons of it in just a day. Yes. I like very much. While there are many anecdotes I could share from this moment, what I enjoyed the most was being able to sit and chat casually with someone whose passion for tea led him to a life where he can continue to learn, continue to explore, provide education to others and introduce them to this amazing world where he has been led. And in my search for green teas, he provided his own recommendation that I’m really looking forward to trying!